Since I launched my blog, most of my posts have been fashion and beauty related, with a few stories about my favorite food indulgence or gourmandises as I like to call them (like this one and that one). Now that I am about to move into a new apartment, in a new neighbourhood with a fresh new decor, I thought that this could be a great opportunity for me to share my great interest in interior design. 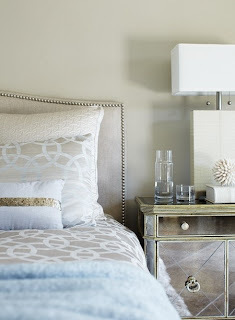 Let's start with the master bedroom! I have always thought that the bedroom is the most personal room in a house. It's a place where we kick-off the day and where we land at the end of a busy day, therefore it's should be warm and cosy. To me, my bedroom is my own private sanctuary. It's where I sleep, I dream, I meditate and also where I read all snug up in my bed at night. When I started to think about the decor of my next bedroom, the first thing that came to mind was the idea of having a beautiful headboard. 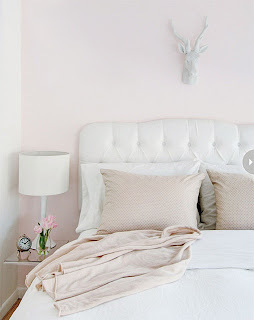 I have always been particularly fond of the 1930s Hollywood Regency style and though I am not sure yet if I will do bold wallpaper, lacquered drawer, lucite chair, mirrored nightstands (this I might do actually), chinoiseries and blue foo dogs, one thing is sure I am definitively getting a glamorous tufted headboard! Ok, the last one is not technically a tufted headboard, but it is certainly decorative and chic, wouldn't you agree? 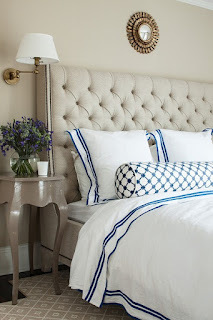 1 comment on "Headboard Frenzy"